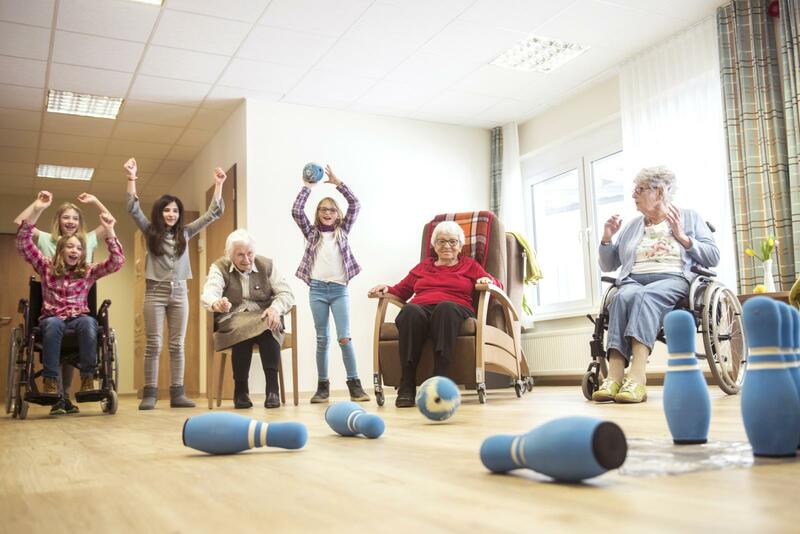 Nursing homes can be busy places, bustling with activities to help keep residents entertained, active, and cognitively sharp. 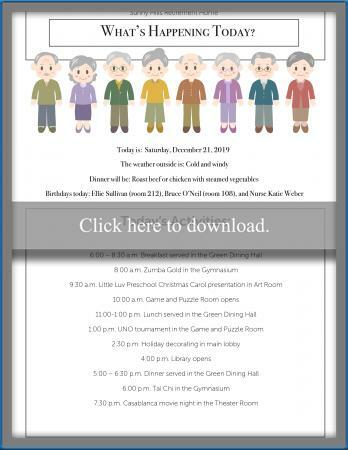 Residents need reminders as to what the daily, weekly, and monthly activities scheduled are so they can make plans and attend the events they enjoy. An activity calendar can help everyone stay on task. 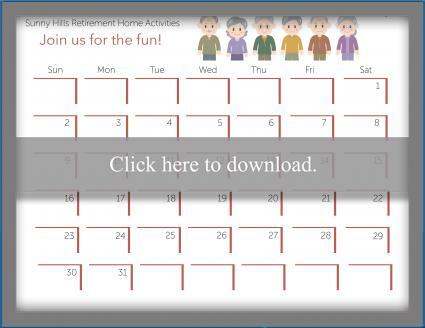 The following printable nursing home activity calendar templates are free to download and print. Customize these templates to suit your needs, or use them as inspiration for designing your own. For more information on accessing these templates, refer to the Guide for Adobe Printables. Depending on how many activities your nursing home offers, you may have to use more than one weekly activity calendar a week. Packing the calendar with small-font type to make it fit will render the calendar useless to residents who can't read small type, or who cannot decipher information when it's jumbled together. 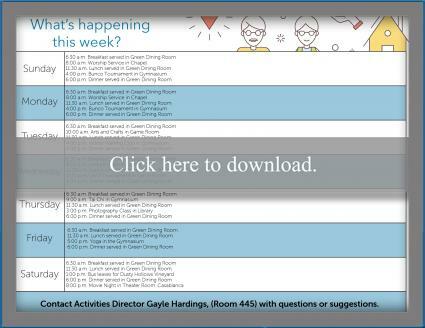 Placing contact information for a staff member in charge of activities on the calendar lets residents know who to contact with questions or suggestions. This monthly activity calendar, presented in the familiar format of a numbered calendar, helps residents plan for their month's activities. When placed in a communal area, task a staff member or active resident with marking an "X" through the days as they pass - this will help residents keep track of their days. Post the activity calendars in prominent spots where residents will encounter them frequently; these should be communal spots that everyone uses. Posting the calendars in the library will do no good for those residents who don't set foot in the library. In an ideal situation, new calendars would be slipped under each resident's door as the calendars become available. A daily calendar helps remind residents of what they intended on doing that day, while the weekly and monthly calendars help with planning for future activities. Adding meal menus or birthdays to the calendars help increase the odds of the calendars being reviewed, even by those residents who choose not to be involved with activities. Calendars that are popular among residents can also be used to get important information out, such as changes in policy or anything else of which residents need to be made aware. 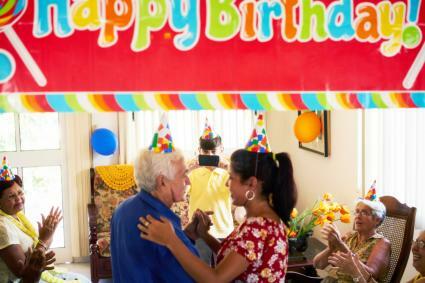 Even if your nursing home offers a veritable smorgasbord of activities, it's important to keep the calendars readable and easy to understand. Don't pack the calendar with so many things in an attempt to give the appearance of variety. The point isn't to show off - it's to inform residents of their activity options. Large print, easy-to-read formatting, and not too many images or graphics to clutter the page will make the calendars more useful overall. Offering a wide variety of activities to residents will help them stay active and get out among other residents. Poll residents and find out what they want to do to pass their time - the answers may surprise you.